Rob Warner enters the MCLA Hall of Fame as an outstanding player. 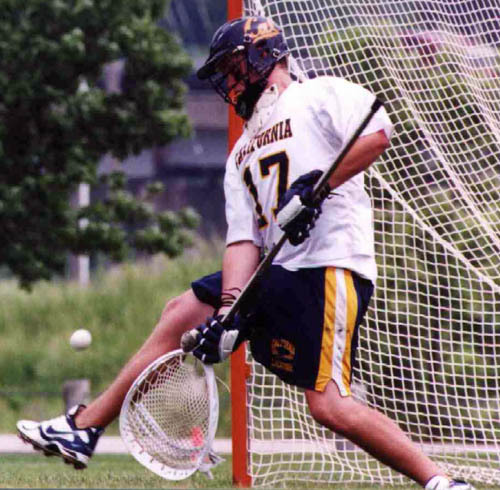 Warner was a standout goalie for the University of California-Berkeley from 1998-2001, backstopping the Golden Bears to a national championship his freshman year. He was a three-time All-American selection at Cal. Cal won the WCLL tournament in 1998 and 2000 with Warner receiving tournament MVP honors at the conclusion of both events. In addition, he was a four-time first team all-conference selection. Warner still holds the record for most saves in a tournament game when he turned away 31 Brigham Young shots in the quarterfinals of the ’99 tourney. Warner graduated from Cal in 2002 with a B.A. in History, and served as an assistant coach for the Bears in his final year. After leaving Berkeley, Warner also coached MCLA teams at Chico State and University of San Diego.